After choosing our paints (read about that in part one of my home renovation series here) and having started some basic work on the new house, we went on to pick out some lighting. Most of the house has spotlights built into the ceiling but there were still 3 rooms that needed some serious change of light. 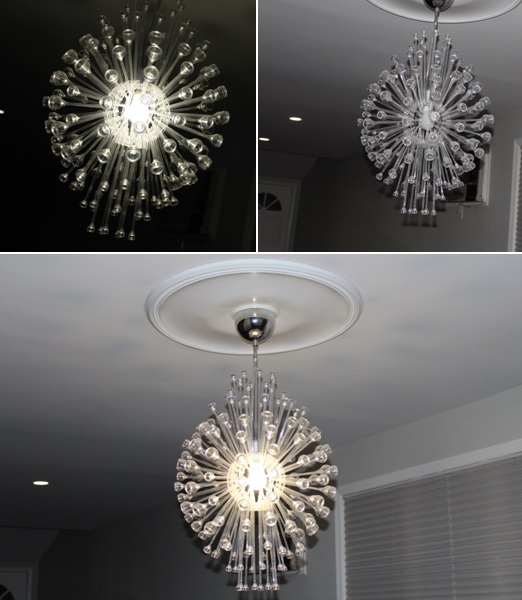 The previous owner took her dining room chandelier with her, the breakfast bar area had a horrific old ceiling fan light over it, and the upstairs bathroom needed a light fixture installed over the medicine cabinet mirror area. I also invested in some really great led white light bulbs since most of the bulbs in the house already were either burnt out or not bright enough. For the dining room I went with this light fixture. It was an easy choice and I'm pretty sure it was one of the first I saw when I began my search. It's striking, different and emits alot of light. I purchased it from Ikea for a pretty decent price too and I have gotten loads of compliments on it already. If you were wondering what my decor style is like you probably have a better idea now, modern and simple are very much my thing. It's called the Stockholm Chandelier on the Ikea website. The only downside with it was that it came in a million ok maybe somewhere around 100 pieces. When they say "assembly required" they mean it! The second light worth talking about is another from Ikea. 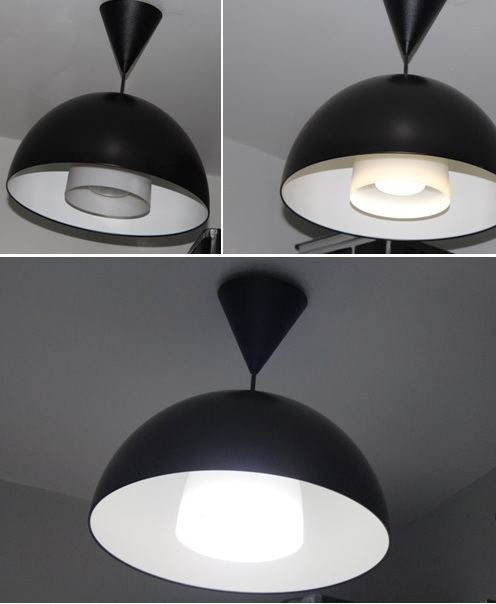 It's called the 365+ Brasa Pendant Lamp. This one hangs over the breakfast bar area in my kitchen. It was the perfect choice because it's not too over sized that it completely shadows the area and it gives just enough light at the same time. There was some really interesting colorful choices like red or white etc. but I decided it would look much more classy in the neutral shade of black I picked. It matches my appliances as well all of which are mostly black. 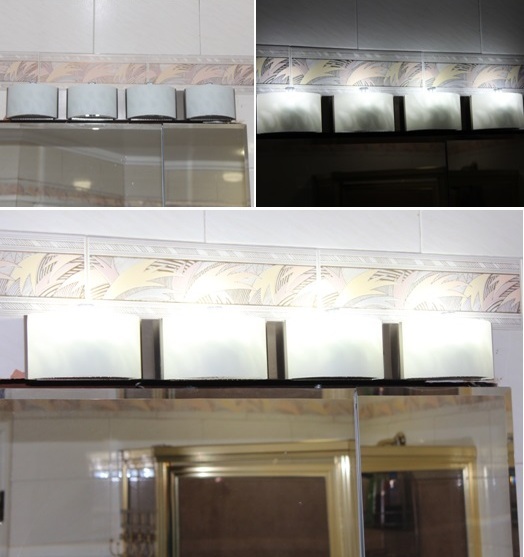 Last on the list was a light for above the bathroom vanity area. The previous owners had a piece of mirror that was rusted and marred situated right above the medicine cabinet mirror. It looked very out of place and so it had to go. My workers were skeptical about whether there would be wires behind it to power a light fixture but I was certain about it from the start. They pulled off the mirror and what do you know? There was actually wires hiding behind it. I found this piece at home depot and although they are now out of stock on it online, a similar one is the Hampton Bay Dakota 4 Light Satin Nickel Bath Bar. It gives off so much light and it really accents the area beautifully. Now all there is left to do is to find a piece of long mirror to hang underneath it and to the sides of it where there are a couple of spaces. It's next on the agenda. I love our lighting so far. It's amazing that a simple thing like light fixtures can make such a huge difference in how a space appears. Paint, check. Lighting, check. Visit my blog again soon to see what we tackled next! I hope you've enjoyed getting another glimpse of some of the changes we've done since purchasing our new house and I look forward to sharing further updates with you very soon! Let me know what you think of the lighting in the comments form below, I would love to hear from you!